One feels the tug of his past throughout the program, and although there is drowsiness in some of the melodies, the harsh opening chord of the Romance in C-sharp Minor, indicates that Foster isn’t constrained by a rosy view of love: “. . .and when love ends, there is always anger.” All but two of the works on the program, most of them composed between 2009 and 2015, are world premieres, and many carry dedications to friends, although the booklet doesn’t elaborate on who they are. One prominent exception is Sir Robert Helpmann (1899-1986), the illustrious Australian dancer, choreographer, and stage director (readers with sharp memories will likely recall him in the classic ballet movie, The Red Shoes from 1948, for which he also did the choreography). Helpmann gave Foster his brig London break in 1971 by asking him to compose incidental music to a hugely successful stage production of Peter Pan. Elegy (1986), written to commemorate Helpmann, begins in a mood of wistful melancholy, but as it progresses, Foster shows that he has range; a turbulent middle episode can’t help but remind lovers of piano music that there’s more to say in the vein of Rachmaninoff’s Études-Tableaux and Liszt’s Sonetti del Petrarca, where rhapsody is guided by deeply personal emotions. Without raising Foster to their height, I came away from this program understanding why Saemann said of the earlier release, “I was listening to it during Hurricane Sandy, and it delivered consolation and relief to my strained nerves.” Other examples of the composer’s range can be found in the desolation suggested by “Loss,” the first of the Six Preludes, where the musical idiom is fittingly pared down. I’d also call Bydlo markedly Lisztian in the dramatically insistent left-hand accompaniment to a stolid somber melody in the right. The piece echoes Mussorgsky’s subject from Pictures at an Exhibition, of a trudging ox cart, but the direct inspiration was a contemporary etching by the Dutch artist Geraldine van Heemstra, who is also the dedicatee. The most ambitious work here, the three-movement Piano Sonata from 2012, returns to a familiar theme in Foster’s imagination, his response to war. “I have tried to capture the utter despair and anger, the loss and emptiness that culminates from war.” It’s a powerful, sometimes vociferous work whose depth owes much to the Russian school of Rachmaninoff,-Scriabin-Medtner, and Foster performs it with great conviction. Yet however dark his subjects, he remains captivated by melody, which is only natural when a composer has the gift. In his review Saemann made comparison to Maurice Jarre; I heard just as much Ennio Morricone, and no doubt every listener will hear other associations in this outpouring of remembrance. The highly dedicated Australian label Melba provides excellent recorded sound, and the Steinway Model D that Foster performs on is very impressive. 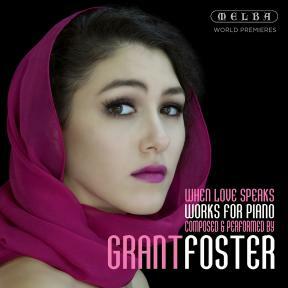 It’s contradictory to say that a composer gives new meaning to “one of a kind,” especially with so many influences hovering over the keyboard, but there’s nothing else quite like Grant Foster’s eloquent romanticism being produced today.